After sleeping well that night, I woke up at around 6AM. Elbert and Randy woke up way too early to make sure they'll catch the sunlight. Still feeling lazy but refreshed after that very wonderful night of rest, I showered and prepared my things since we already agreed that we will be going around Baguio City again until before lunch and then we'll be leaving for La Union after that. 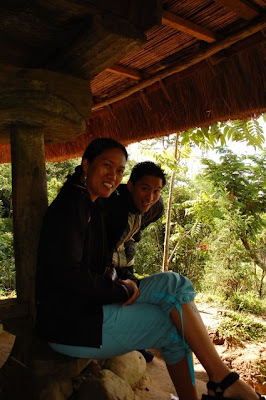 So, we decided to visit Tam-Awan Village which is located in Pinsao Proper, Baguio City. We took a cab going there and paid only P47.00. I really like the idea of taking cabs in Baguio since the fair is so affordable and it is more comfortable travelling that way. We had breakfast in the cafe in Tam-Awan Village, I had Tocino with Egg and brown rice, and the other guys had beef tapa and longganisa. It was my first time to eat brown rice... I was fascinated by it... the color is actually almost violet, I'm not really sure if it was fried or boiled because it is quite moist and a bit sticky. I liked it though. The coffee was also very good that's why I had 2 cups of it. After breakfast, we went around, check out some of the artworks displayed in the gallery and bought a few things at the souvenir shop. I bought a pair of dangling, blue earrings for myself. 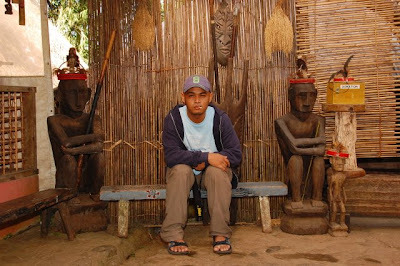 I would have loved to see the inside of the "Dukligan Hut" (Fertility Hut) but it was occupied that time. 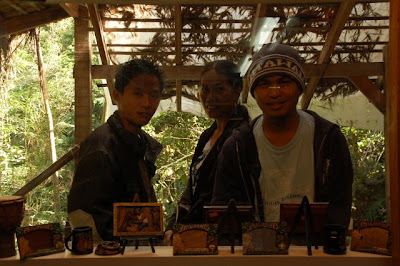 So we were contented to just have our pictures taken outside some other huts. We went back to the hotel then and prepared to leave for La Union. On our way going to the terminal, we bought some more wine... strawberry wine, rice wine and the other two that I can no longer recall. It's still sitting on top of my table at this time, though the rice wine is almost gone. I'll be telling you about what happened to us in La Union next time. Photos courtesy of Randyblu... thanks so much!